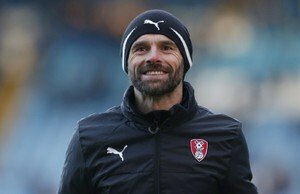 Rotherham United Manager Paul Warne can have been nothing but delighted firstly with the win this afternoon but also with the way his players came back from last weeks defeat at Derby. And that’s exactly how it felt this afternoon. The Millers were as good today and they were bad last weekend. The football flowed today and you really couldn’t find a man of the match as they played, as they were doing earlier in the season, as a team. The unity was back. And to say all the players looked ‘done in’ when the final whistle went will tell you how they played. Warney went on to say that he didn’t think the quality of the first half, from the Millers, was good saying the second half was better. I thought we did alright in both halves and even managed to wind down the clock in the final five minutes or so. Nottingham Forest are not a bad team at all. They hit the post twice and brought out a couple of good saves from Marek Rodak, so to get the win is a big boost. And we needed the win today – not just because we obviously need the points but for the confidence it will give us ahead of our home game with Aston Villa on Wednesday evening. More of the same on Wednesday night would be nice!